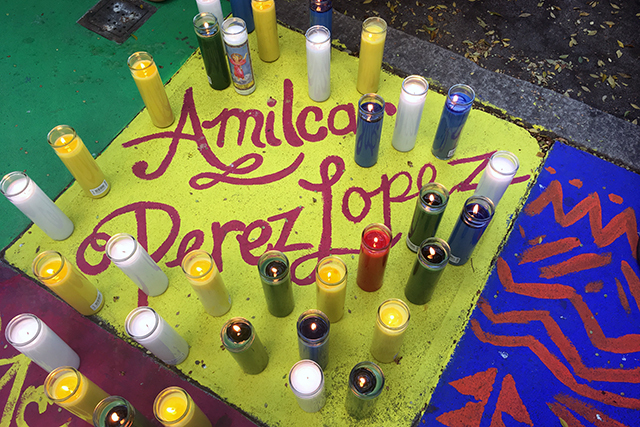 Some 60 people marched through the Mission District Friday night and called for the state attorney general to take over the investigation into the two police officers who fatally shot Mission resident Amilcar Perez Lopez. The rally marked the 18-month anniversary of the 21-year-old Guatemalan immigrant’s death. Protesters said they are tired of awaiting results in an ongoing investigation into the police shooting by District Attorney George Gascon. To that end, they said, they are asking State Attorney General Kamala Harris to take the case. They made the announcement at a conference held at Folsom Street between 24th and 25th streets – where Perez Lopez died. 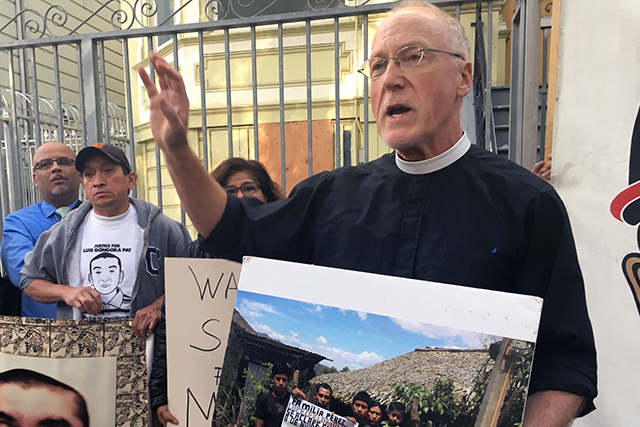 “We are beginning the conversation with Harris because that is our next legal recourse,” said Father Richard Smith, vicar of the Episcopal Church of St. John in the Mission District. “This is a moment to do the right thing,” he said urging Harris to accept their request. 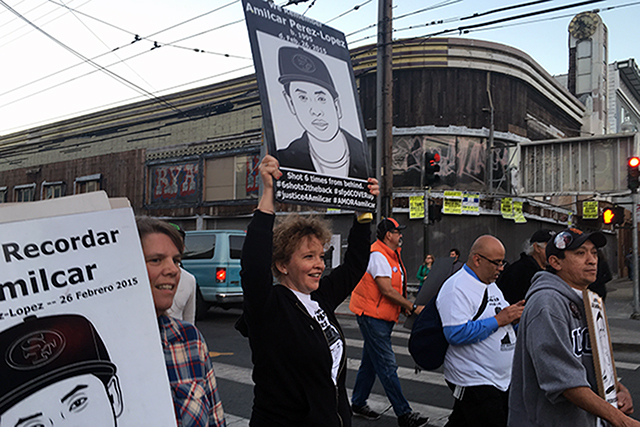 For the past five months, Smith has held weekly vigils outside of the Mission police station at 17th and Valencia streets to draw attention to Perez Lopez’s case and to pressure Gascon into prosecuting the officers. But that hasn’t happened. Instead, Gascon told Smith during a July 25 meeting that he had not yet completed his report and was “waiting for some information to come in to him,” said Smith. On Thursday, Gascon told media that he is “nearly ready” to announce the results of his investigation, and that some homicide investigations take years to complete. But many community members are unwilling to wait that long. Smith hopes that a prompt and fair criminal trial in Perez Lopez’s case will set a precedent in holding police accountable for murder. In February 2015, plainclothes officers Craig Tiffe and Eric Reboli said that they responded to a bike theft involving Perez Lopez, who allegedly charged at them with a knife, causing the officers to open fire. But an independent autopsy report revealed that Perez Lopez was shot six times from behind, and police testimonies are in conflict with statements given by two eye-witnesses who have said that Perez Lopez was robbed of his phone by a bicyclist and had dropped his knife before being shot. “The officers have changed their story three times,” said Smith, adding that police tampered with evidence by ordering the removal of Perez Lopez’s body at the crime scene before it could be properly investigated by city officials. 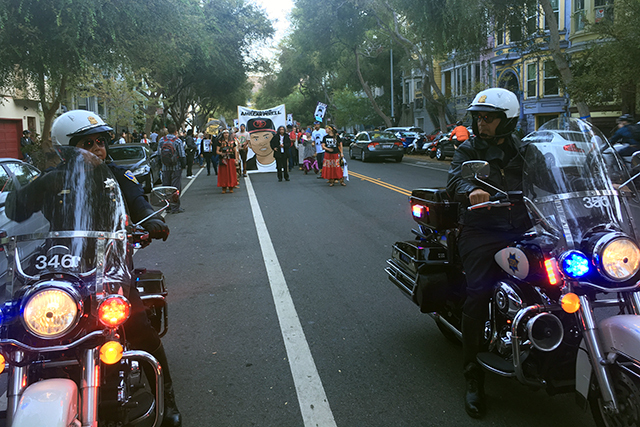 Chanting “No Justice, No Peace,” the protesters marched toward 18th and Shotwell streets where Luis Gongora Pat, a Mexican immigrant, was shot and killed by police in April 2016 at the homeless encampment where he lived. Onlookers joined the protesters who, accompanied by two motorcycle officers and a police car in tow, snaked along Folsom Street. The police presence increased notably as protesters continued towards 17th and Valencia streets, where they formed a circle in front of the Mission District police station. 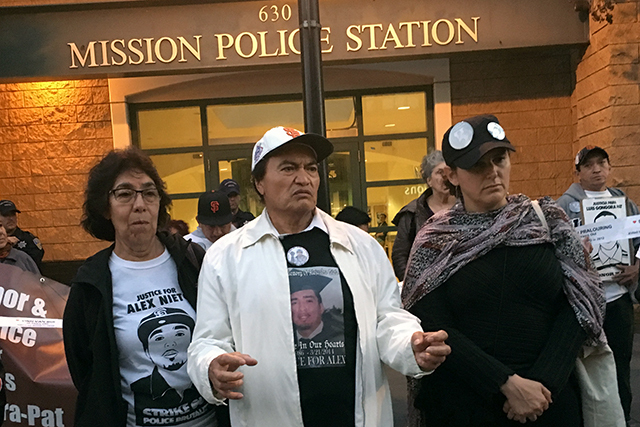 There, the parents of Alex Nieto, a 27-year-old security guard who was carrying a taser and allegedly pointed it at police officers who then fatally shot him on Bernal Hill in 2014, addressed the protesters. “We have to to stop traffic, block the streets, create commotion on a Friday night – otherwise we will never see justice,” said the man’s father, Refugio Nieto. The four officers who shot Nieto were cleared by a jury in a civil trial in March. Community members who came to support the protesters agreed. And they plan to continue their activism until justice is served, said Smith, who called on the Mission community to remember Perez Lopez and others killed by police by joining him for their weekly vigil, now in its 21st week, next Wednesday. “We are digging in our heels and we are not going away,” he said. What I don’t understand about last night’s actions and previous vigils on Wednesday nights at the Mission station, is why do the protesters think not going to Gascon’s office or home applies pressure to him? He does not work or live at the police station, so why not stage regular actions at his office at 850 Bryant? Gascon is a skillful and ambitious politician and his recent texts about the Luis Gongora killing by the SFPD, and failure to indict officers, reveal how well he strings along community organizers. Read the texts here: http://mpetrelis.blogspot.com/2016/07/texts-reveal-da-gascon-co-opts-sfpd.html. When will law enforcement accountability activists get out of their comfort zones in the Mission and make noise at Gascon’s office? Since Gascon was selected by the Mayor to be DA, there have been 20 civilians killed by the SFPD and zero indictments. The tactics of activists during this time has not succeeded in getting the ex chief of police to bring charges. Now is a good time to evolve with tactics and targets of where to demonstrate or hold vigils. Your a racist. Police are NOT above the law. Only GOD is above the law. Forgot to mention in previous comment that if activists want Kamala Harris to take on the killing of civilians by the SFPD, please stage actions at her local office in the State Building on Golden Gate Avenue. Apply pressure on where she maintains a state-funded office. If she has a campaign office in San Francisco, that would also be a great site for a few actions. Harris isn’t going touch this- no reason too. DOJ didn’t want it why should she? I might’ve appealed to Sanchez her opponent. Unfortunately, this movement is on a slow drift to nowhere. All the martyrs will not result in any charges bring filed. The lost lawsuit guarantees that.